Since 2014, Arlington Transportation Partners (ATP) and Arlington Public Schools (APS) have collaborated to encourage healthier, safer, and sustainable transportation options, and reduce the amount of vehicle traffic and parking congestion in Arlington. 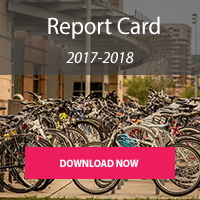 Through ATP’s partnership with APS, more than 40 schools and sites are encouraging their staff and teachers to adopt new transportation options including carpooling, walking, and biking to work through transportation programs that meet the unique needs of each school. ATP’s transportation services help create a better school environment, reduce congestion, and provide better transit options and benefits to APS staff and community. ATP will work your school to educate staff on mobility amenities, implement carpooling or vanpooling initiatives, and make active transportation a more feasible form of commuting for anyone.